Primary Natural Resources phosphate (depleted by 1979), copra. THE REPUBLIC OF Kiribati consists of 33 atolls straddling the equator and the INTERNATIONAL DATE LINE. The country is composed of the Gilbert Islands, the Phoenix Islands, and the Line Islands. The Gilbert Islands are made up of 17 atolls, are home to the majority of the population, include the capital Bairiki, and harbor the once phosphorous-rich island of Banaba. The Phoenix Islands are composed of 8 atolls, none of which has a permanent population. These islands were part of a government relocation program in the 1930s and 1940s as an answer to overcrowding on other islands, yet by 1952 the plan was considered a failure. Resurrection of a similar plan began in 1995 and may lead to future permanent settlements. The Line Islands, of which only three of the eight are inhabited, include the largest of the islands, Kiritimati (CHRISTMAS ISLAND). Kiritimati is the largest atoll in the world and encompasses approximately half of the Kiribati landmass. 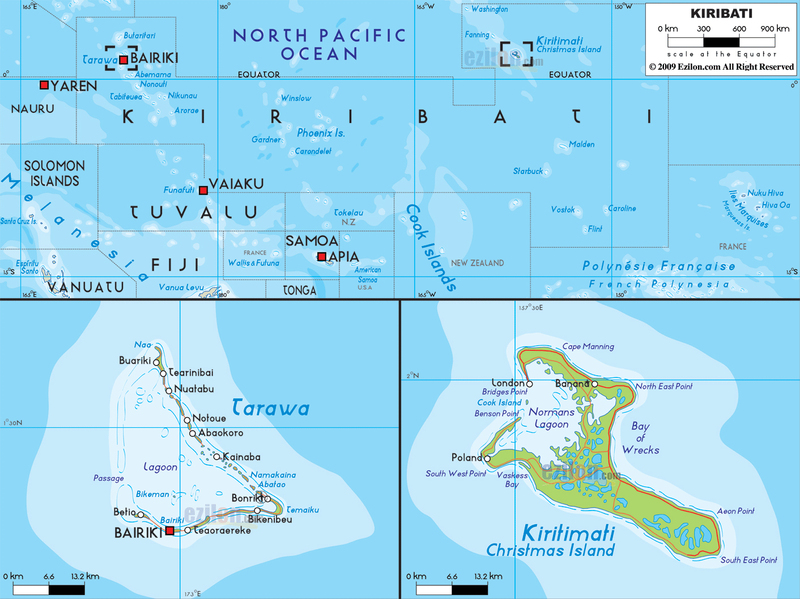 A remote country, Kiribati is primarily composed of atolls with little variation in topography. The reefs, flats, and lagoons surrounding the atolls are natural attractions for the growing tourism industry. Global warming issues and the resulting rising sea levels have become a concern for the nation, as most of the country is at sea level. The climate is tropical with the potential for typhoons occurring primarily from November to March. The majority of the population is of Micronesian ancestry with many of the ancestors originating from Tonga and Fiji. English is the official language, while IKiribati is widely spoken. In 1892, the British proclaimed the island group a British protectorate. From 1963 until 1979, the islanders were given an advisory position in the political decisions of the nation and gained final independence from the British on July 12, 1979. With the independence came the name change from the Gilbert Islands to Kiribati, which is the local translation for the Gilberts. This sovereign democratic republic is resided over by a president, composed of three administrative units that are split into six districts and 21 island councils, and holds a parliament consisting of 42 representatives. Local affairs are handled by local councils. Prior to 1995, the islands were split by the international date line (180 degrees longitude), but in a unilateral move, Kiribati moved the international date line so the entire country could share the same time zone. The economy is presently based on copra and fish exports, the granting of fishing rights to foreigners, the remittance of income from overseas workers, and international aid. Tourism has become a major export earner bringing in approximately one-fifth of the GDP. The local currency is the Australian dollar.